The founder of the Sanjo School was Sanjo Munechika. (三条宗近). He worked around the Eien era (987-989). Exact records from that far back are somewhat sketchy and conflicting but many old written records remain listing several smiths who followed him and succeeded to his teachings. Yoshiie (三条吉家), Arikuni (三条有国), Kanenaga (五条兼長), and Kuninaga (五条国永) are said to be the sons or grandsons of Sanjo Munechika (三条宗近). Of these smiths, Kanenaga (五条兼長) and Kuninaga (五条国永) worked in Gojo (五条) in Kyoto so these two smiths are called Gojo Kanenaga (五条兼長) and Gojo Kuninaga (五条国永). The terms “Sanjo” and “Gojo” come from the street names in Kyoto where these smiths were located. Those same streets survive to this day. Gojo Kanenaga (五条兼長) is said to have had three students, Kuninaga (国永), Kanetsugu (兼次), and Kaneyasu (兼安). There are no surviving works by Kanetsugu (兼次) or Kaneyasu (兼安). Only the works of Kuninaga (国永) survive today and signed examples are only a small handful. Many old texts tell of Kuninaga (国永) and the many famous blades that he made. Kuninaga (国永) worked around the Tengi period (1053-1058) during the Heian Era. 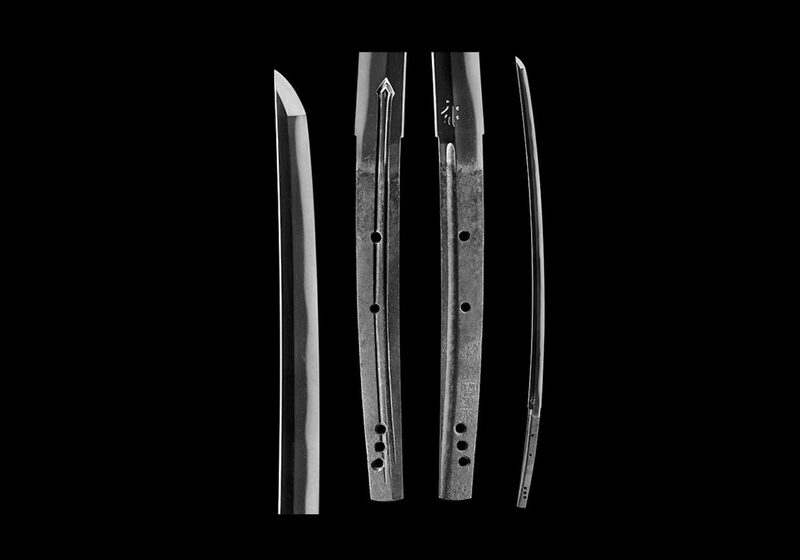 The Honjo Kajiko tells us that Kuninaga (国永) was the smith who made the blades called Ryutomaru and Kikumaru that were owned by the Emperor Go-Shirakawa (1155-1158) who was well known as being the Emperor who was involved in the Gempei wars involving the Heike and the Genji. Kuninaga (国永) is best known as the maker of the famous blade, Tsurumaru, which is now in the Imperial Collection. This blade is listed in the Kyoho Meibutsucho as having belonged to Hojo Sadatoki (1285-1301). 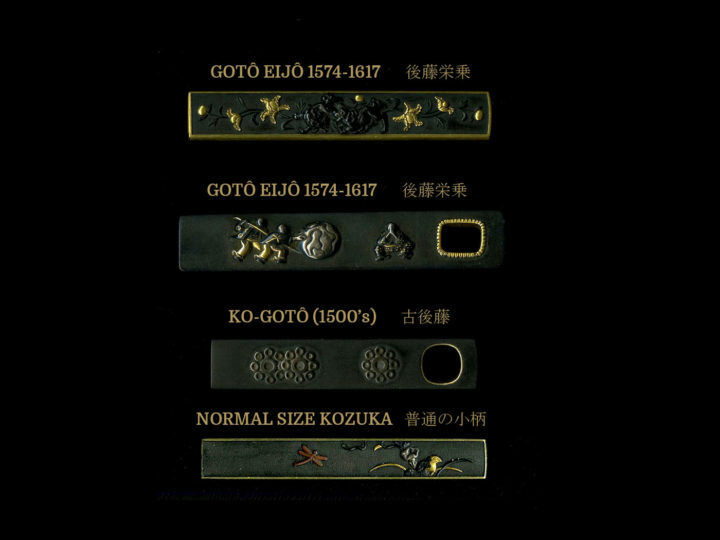 It was handed down from generation to generation among the Hojo and later came into the hands of Oda Nobunaga who gave it to one of his retainers, Mitsumaki Kanbei. Around 1680 it was given (or sold) to the Date family of Sendai and remained with them until Emperor Meiji took it from the Date for the Imperial Collection. The Tsurumaru is thought to be the best-preserved blade of the Heian Era in that it is perfect having received very few polishes over its long lifetime and being ubu with one mekugi ana. The blade measures 2 shaku 5 sun 9 bu 3 li. with a sori of 8 bu 8 li and a machi–haba of 9 bu 2 li. It is shinogi zukuri with ihori mune and a small kissaki. There is deep koshi-zori with strong funbari. The hada is ko-itame with lots of ji nie. The hamon is ko-midare with ko-choji and some tobiyaki. There are ashi with deep nioi and nie clustered around the nioi. There is kinsuji around the monouchi area. The boshi is made in midarekomi with the front side made in togari style and the backside in komaru with a very short kaeri. The nakago is ubu in kijimomo with very little sori, the tip is made in kurijiri and the yasurimei are katte-sagari. Above the one mekugi ana is the two- character signature Kuninaga (国永) near the mune. Number 1 is the famous Tsurumaru blade that has been discussed. Number 2 is one of only two ken blades from the Heian Era and it is designated as a Juyo Bunkazai. Number 3 is a tachi enshrined at the Ise Jingu. Number 4 is a tachi with a Juyo Bijitsuhin designation. 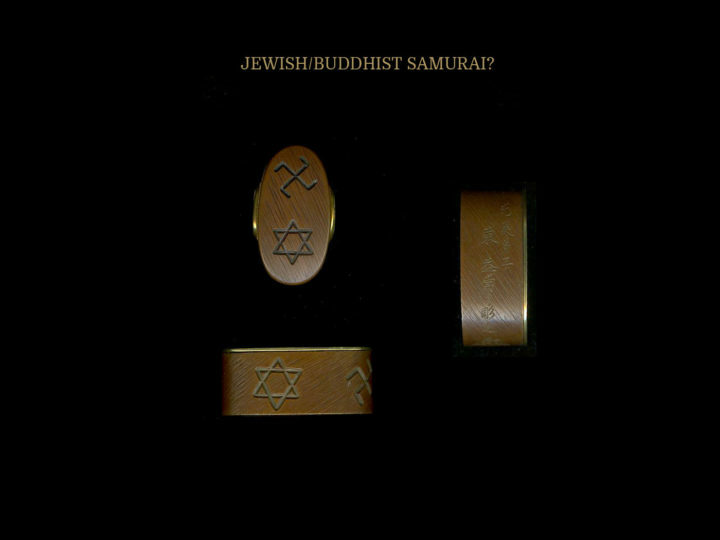 Number 5 is a tachi, which had been a family heirloom of the Bizen Ikeda Daimyo family. Close studies of the different mei bring out the similarity in the character “Naga” (永) of numbers 1, 4, 5, and the kantei blade. The characters “Kuni” (国) in these four are all squeezed lengthwise and look alike with only the formation of the strokes inside the box being of two different types. Because of these similarities, the works of numbers 1, 4, 5, and the kantei blade have a very good possibility of representing one and the same Kuninaga (国永) who probably changed the style of his mei during his productive years. 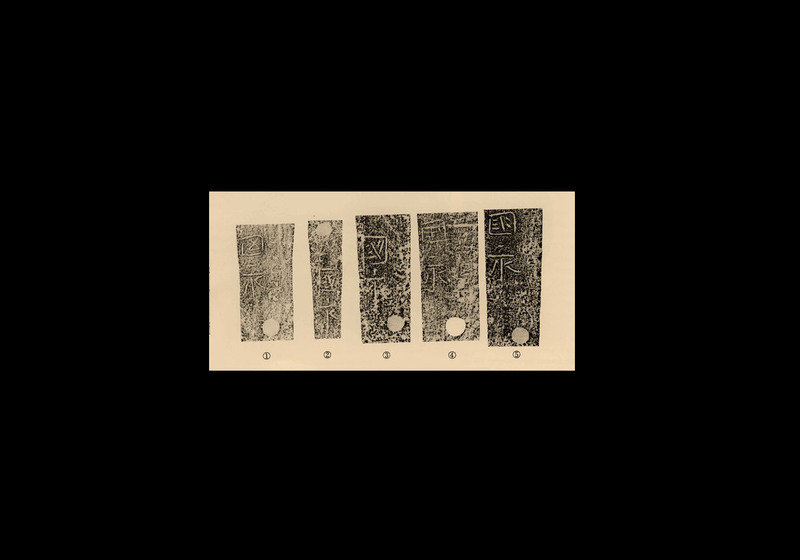 The mei of numbers 2 and 3 have practically identical mei inscriptions in common with each other. Their “Kuni” (国) characters are somewhat stretched lengthwise and the strokes within the box are straight and matching. Additionally the dot stroke at the top of the character “Naga” (永) is straight downward while it is slanted in the other four examples. Again, whether these two swords were done by another generation or merely changes made by Kuninaga (国永) in his mei over his lifetime will need further study in the future. The blade that is the inspiration for this article is a tachi that is shown in the photo at the beginning of this article. It received the designation of Juyo Bijitsuhin on Showa (昭和) 22 or 1947. The certificate was presented to the owner, Date Muneaki. Like the famous Tsurumaru that was described in detail earlier in this article, this blade was a treasure of the famous Date Daimyo family. Date Muneaki was the eleventh hereditary Daimyo of the Uwashima branch of the Date family. The Date Uwashima branch was formed when the oldest son of Date Masamune, Date Hidemune, was relocated to Uwashima in Shikoku Island at the request of Tokugawa Hidetada, the second Tokugawa Shogun. Date Hidemune received his name from Toyotomi Hideyoshi who allowed him to use the character “Hide” (秀) in his name. 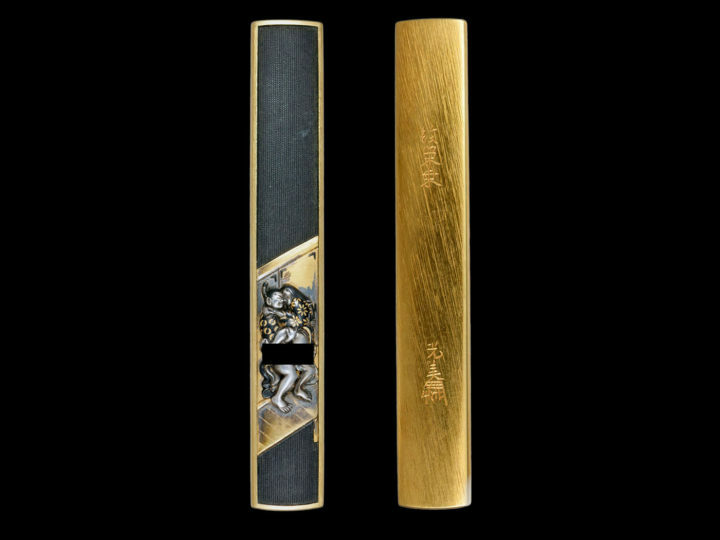 The fact that this blade’s koshirae contains profuse amounts of the Tokugawa family’s Aoi mon also shows the close ties between the Date family and the Tokugawa family. Also accompanying this tachi is a kanteisho (certificate of value) by Honami Kochu that was written in Shotoku (正徳) 2 or 1716. It states that this blade had a value at that time of five hundred kan. Four kan were equal to one koban (gold coin). This would set the value of this sword in the early 1700’s at 125 gold coins. This tachi has a nagasa of 2 shaku 2 sun 9 bu. It has the graceful koshi-sori with a pronounced straightening toward the monouchi area and ends in a smallish kissaki. It has a beautiful ko-itame hada. Throughout the ji are many ko-nie forming a profuse amount of yubashiri. Utsuri is also present and presents itself in an overall cloudy appearance. There is a feeling of wetness to the metal. The hamon is nie based and consists of numerous small ko-choji like formations with square tops that are very irregular. The boshi is ko-maru with a very short kaeri. There is a koshi-hi (short groove) on omote of the blade and a suken on the ura. Both are deeply carved. The nakago is slightly shortened but the two-character signature is clearly present. As stated above this signature appears to be done by the same hand as the mei on the Tsurumaru. SUGATA: The shape will be the classical shape of the Yamashiro School of the Heian Era. They will be shinogi-zukuri, iroi-mune, and relatively slim with a narrow shinogi-haba. There will be strong funbari. The sori will be koshi-zori but there will be a marked straightening in the mono-uchi area. The kissaki will be small. JITETSU: The kitae will be ko-itame mixed with nagare-hada and moku-hada. The ji-nie will be thick and contain chikei and yubashiri. HAMON: It will be worked in nie and will be suguha based with ko-choji, and ko-midare with an abundance of nie clustered around the nioi within the ha to form ashi. Some blades had a more Bizen feel to them and the nioi will be more pronounced, but profuse nie will still be present forming inazuma and kinsuji. BÔSHI: The kissaki is small and the bôshi will be in komaru shape with a short kaeri. The nie in the bôshi will appear to overflow into the ji area. Works done in a choji-midare style will not have as much nie in the bôshi. HORIMONO: Koshi-bi is seen but other styles of carvings are very rare. One should note that carvings will be deep which is indicative of blades made before the middle of the Kamakura Era. NAKAGO: They will be long and slender with a kurijiri tip. The yasurimei will be katte-sagari. MEI: Always a two-character signature, Kuninaga. The particulars of the mei have been discussed.